Get to know the layout of Samsung Galaxy Note 5. The part name and major functions are illustrated in front view and rear view. Galaxy Note 5 has a new and refreshed design. The location of some ports and buttons are quite different from those in Galaxy Note 4 or other Galaxy Note devices. Galaxy Note 5 layout is actually similar to that of Galaxy S6 edge and Galaxy S6 edge+. 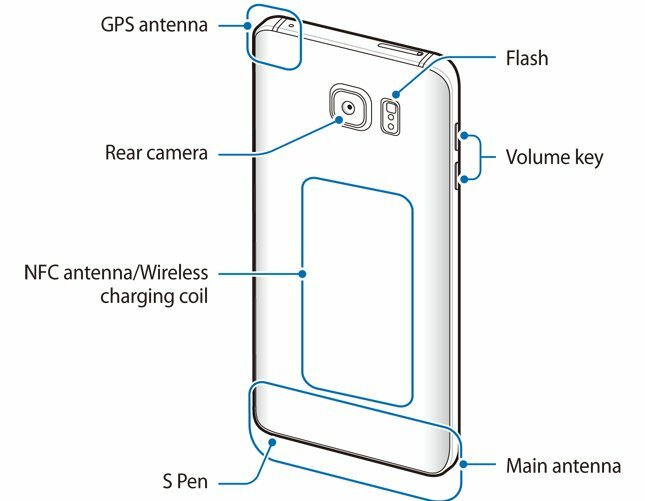 It is important to understand the Galaxy Note 5 layout before trying your phone if you want to use the phone properly (e.g., not cover the antenna area). This guide will show you the Galaxy Note layout and main functions of some parts. The front (top, right and bottom) view of Galaxy Note 5 layout is shown below. Proximity/light sensor. Galaxy Note 5 may use this sensor to adjust the screen brightness if you set brightness as auto. So, do not cover this area. Touch screen. The screen will respond to your gestures depending on apps you are using. The Galaxy Note 5 touch screen gestures are discussed in this page. Home key with fingerprint sensor. Tap this button to return to Galaxy Note 5 home screen. Fingerprint sensor is also embedded in this home key. Recent Apps key. Tap this key to show a list of recent apps. You can quickly switch to them. Back key. Tap back key to return to previous screen. The behavior in different apps may be different. If you need return to home screen quickly, use the home key. Headset jack. 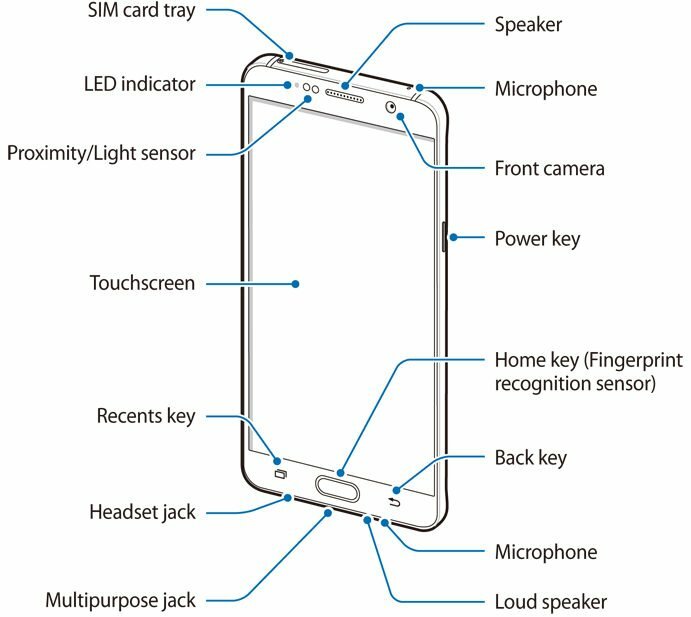 In previous Galaxy Note phones, the headset jack is on the top. Micro USB port (multipurpose jack). This micro USB port is for you to charge Galaxy Note 5, or to connect Galaxy Note 5 to PC. You can also use this port to connect accessories, e.g., USB OTG storage. S Pen and S Pen slot. Power key. You can use power key to reboot the phone, lock the screen, or wake up screen. In some apps, you can assign some special functions for power key. SIM card tray. You need put your nano SIM card into the tray. Please follow this guide on how to use SIM card on Galaxy Note 5. The rear view of Galaxy Note 5 layout is shown above. LED flash for main camera. You can also use the flash as torch. Heart-rate monitor sensor. You can use the sensor to measure heart rate, SpO2 (Peripheral capillary oxygen saturation) and stress level in S Health app. You can also use it as shutter button when taking selfie. You need pay attention to the location of antenna area as mentioned in the above Galaxy Note 5 layout. You should not cover the antenna area with your hands or other objects. This may cause connectivity problems or drain the battery faster in Galaxy Note 5. If you want to use a screen protector for Galaxy Note 5, using a Samsung-approved screen protector is recommended. Unapproved screen protectors may cause the sensors to malfunction. Galaxy Note 5 is NOT water resistant. So, you should not allow water to contact the Galaxy Note 5 touchscreen or other parts. The touchscreen may malfunction in humid conditions or when exposed to water. In most regions, water damage to Galaxy Note 5 is NOT covered by Samsung local warranty. Do you know Galaxy Note 5 layout now? If you have any questions on Galaxy Note 5 layout or the functions, please let us know in the comment box below. Antenna for what? Mobile network, GPS? What problems did you encounter when using Snapchat on Note 5? There are no known problems of Snapchat on Note 5. If the Note 5 is carrier specific model, the hotspot icon may be missing/hidden from the firmware. But this is rare nowadays. Do you mean ringtone for individual contact? Please refer to this guide. What happens if you call others? My S Pen will not fit back in the slot all the way. Not sure why. Do you mean you cannot put the S Pen in to the slot competently? You may check the slot in the service center. I am using note 5 since 8 months.I am facing network coverage issues .while note 4 has no problem. Is it because of a transparent back cover am using? Not sure. But you can compare the signal info from Note 4 and Note 5 at same time and at same place. You can get signal strength info on settings – about device – status – sim card status. Hi I bought a samsung galaxy note 5. My problem is unlike iphone 4 I can not hear my own voice when using the microphone on karaoke apps from my headphones. How do I turn it on? It depends on the app. You can check with the app developer. Apps work differently in iPhone and Android. Do you want to get the microphone icon or hide it in your keyboard ? Anyway, the microphone icon in your keyboard corresponds to be Google voice typing. You can enable or disable voice typing to show or hide the microphone icon in settings – language and input – default keyboard – set up input methods. I can only talk using speaker. When I turn it off I can’t hear nothing on my note5. What do I need to do. You can try took reboot the phone. You may also visit service center to check the earpiece. I’ve been using the spiffy Note 5 for a few weeks now and I am having trouble with the fact that, unlike on the S4, the volume up/down keys on the left side project instead of being one recessed key – the effect is that when holding the phone in one hand I often am accidentally pressing both the right side button and a left side button at the same time .. is there any advice on avoiding this, other than to work on practicing holding it differently? Thanks. (I suppose having separate projecting up and down volume keys was consider an “improvement”?). Also, is there a way to move media volume other than when a media file is loaded? You cannot change the hardware layout. I can understand the problem you are facing. For adjusting media volume at anytime in settings – sound and notifications – volume. Its an app called xpress count. I can’t get it to pop up I n this phone. On a note 4 u did it by holding the left side key botton. I can’t get the settings menu to pop up. Hardware menu button was completely removed in Galaxy Note 5. Actually, there are no new Android phones in the market offering hardware menu button. All apps are supposed to use software menu button (3 vertical dots, usually in top tight) or software navigation button (3 lines, usually in top left). You need check with the app developer whether they have any updated versions of the app. How to access context menu in note5?? What context menu are you talking about? Different apps may have their own context menu. This fully depends on individual apps. I need to use the settings on an app to pop up the log in information but I don’t know how to make it pop up on a note 4 u do it by holding down the back key while the app is open. Could you help me get thus done. The hardware menu option was gone in Galaxy Note 5. Recent apps should use software menu button. I dont know how to turn phone off unless i shut it shuts down to no power. Turning off usually means shutdown power. Do you just want to turn off display? If yes, press power button once.